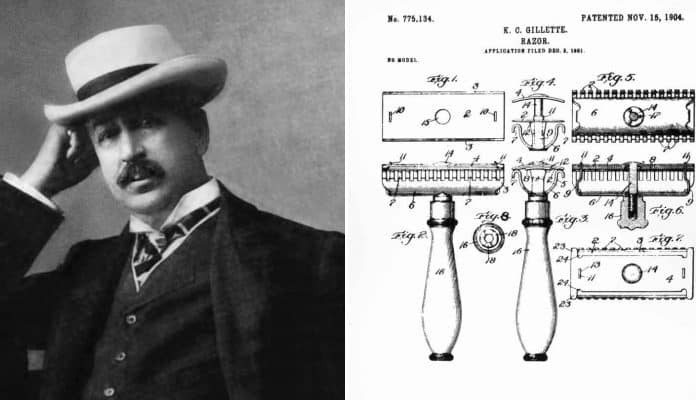 Born on January 5, 1855, in Fond du Lac, Wisconsin King Camp Gillette grew up to become the inventor of Gillette Razors, the modern-day safety razor. Later, his family moved to Chicago, Illinois, where he lived for many years. While the future household name worked the Crown Cork and Seal Company as a salesman during the 1890s, he noticed all the bottle caps from the cork seals he sold thrown away. Gillette then thought of how often people threw things away after using the item once to a few times. The safety razor became a part of the retail market starting in the mid-1800s, but they still needed a lot of work. The razors needed sharpening often because they quickly became dull. Soon, Gillette realized that men needed a safety razor where the dull blade could be removed and then discarded. He felt that this would make a huge profit, so he quickly got to work. Gillette took previous designs of safety razor blades and improved them. Gillette razors from 1900 to 2016. Mass Moments. While Gillette’s razors were expensive for the late 1800s, they sold for half the price of a man’s weekly salary; millions of blades sold quickly. Gillette went on to organize the American Safety Razor Company in September of 1901. The company’s name would change a year later to Gillette Safety Razor Company. The first year 168 blades and 51 razors sold. However, the second year, Gillette’s sales and profit more than doubled. During the second year, Gillette sold 90,884 razors and 123,648 blades. A 1904 patent for Gillette’s razor. Gillette/ Twitter. Much of Gillette’s success occurred because his razors were cheap compared to other safety razors. Within a few years, the company expanded to include not only the United States and Canada but also Britain, France, and Germany. In 1915, the company sold over 70 million razor blades. Two years later, the United States became a part of World War I and the Gillette Safety Razor Company sent all American soldiers a field razor set. However, the company did not lose any money on this as the United States Government paid them for the razor set. A few years later, Gillette sold his company to John Joyce. However, Gillette’s name stayed on the razors. King C. Gillette lived out the rest of his life struggling. Not only did his finances take a hit from the Great Depression, but he never spent his money wisely and often bought expensive items. Therefore, the infamous businessman lived out the rest of his reasonably poor but was able to escape bankruptcy. He passed away on July 9, 1932, in Los Angeles, CA.